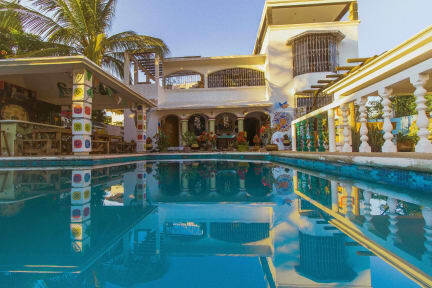 Vivo Escondido Hostel kohteessa Puerto Escondido, Meksiko: Varaa nyt! We were 3 girls staying 4 nights here and it was amazing! The staff was very welcoming and helpfull. Athmosphere in hostel is super chill and relax. Everyone enjoying each other company in the evenings and showing around. Rooms and bathrooms were very very clean, one of the most cleanest hostel that we have ever stay! Breakfast was SO GOOD and the cleaner ladies really nice and kind! Somehow we made friends with them also 😀 Location is perfect! Thanks to everyone and we will be back!